The DL4 and R1 have been discontinued. 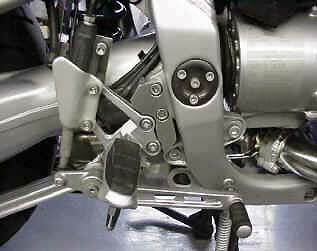 This photo shows an R1100S with the foot peg lowering kit and the handlebar riser kit installed. The rider is 6' 4" tall. Pegs move 40mm (1.57") down and back at 15 degrees. This equals the mounting hole spacing and angle of the rear master cylinder. Net down is 1.516", net back .406"
Left Side: Note shift linkage extender. 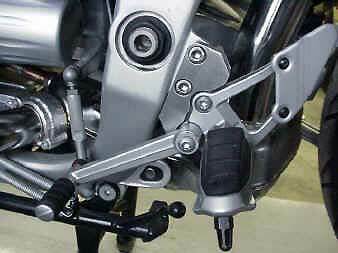 Shift lever relocates with footpeg. All mounting hardware is included. Right side: Note master cylinder linkage extender. The master cylinder does not move, the brake fluid circuit is not disturbed. If you have the Boxer Cup Replica, the lowered shifter will interfere with the belly pan. Option#1: Trim the belly pan. Option#2: Remove the belly pan and avoid stone chips. Option#3: Live with the pegs high. 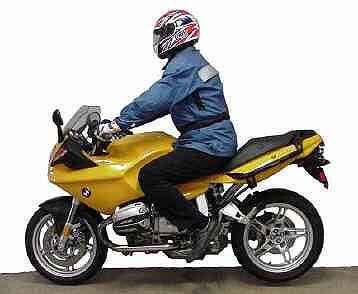 Towards the end of the R1100S production cycle (2004-2205), BMW built a limited edition R1100SLA. On this bike there is a different (short) arm on the input shaft of the transmission. linkage will interfere with the frame. The standard transmission arm is pictured in photo #2 above. DL4 and R1 have been discontinued.